Some 40 million Americans suffer from chronic snoring: that’s one sixth of the population. If your partner keeps you awake with loud snoring, or your partner complains that you snore too loudly, it could be that either of you is suffering from sleep apnea. If this is the case, it can cause several problems. Not the least of these is fatigue during the day, but it can also cause memory loss, hypertension (high blood pressure) which can lead to heart disease, and problems with breathing. It is a potentially life-threatening condition. Our Dr Rabinovich is a specialist in sleep apnea surgery in SF and has created partnerships with sleep experts who can ensure that your sleeping problem is evaluated and that you are provided with the right treatment. 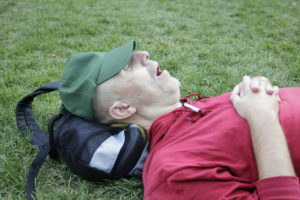 This could mean that you need sleep apnea surgery in SF, but better that than the alternatives. In any event, sleep apnea surgery can often be carried out under a local anesthetic, so in that sense is similar to having wisdom teeth extracted. There are several risk factors for sleep apnea, not the least of which is simply being male, since men suffer from it more than women, although it does increase in women after the menopause. Being overweight, using too much alcohol, and suffering nasal congestion can also contribute to sleep apnea. So can using sedatives, which you may be doing if you are having difficulty sleeping. Another thing is a family history of snoring because there could be a genetic cause. It can also cause irritability, and loss of sexual function in men. People who may benefit from sleep apnea treatment are those who suffer from chronic snoring, have difficulty breathing, suffer loss of concentration and fatigue during the day, have complaints from their partners about snoring, and may also have had bed partners witnessing cessation of breathing which can occur repeatedly throughout the night and can last for many seconds each time. If you suffer from any of the symptoms mentioned above it is well worthwhile to have a consultation with Dr Rabinovich. He provides a completely free consult for all patients and you can book one simply by phoning the office or by clicking on the Contact Us link at the top of the page. Treatment does not always involve surgery and could be as easy as a weight loss plan or an oral device to help overnight. Even if a form of surgery is necessary, it is often a simple outpatient procedure performed under local anesthetic. So if you think you may be suffering from sleep apnea, book an appointment with Dr Rabinovich without delay. This entry was posted in Blog and tagged San Francisco sleep apnea surgery, Sleep Apnea, Sleep Apnea Surgery San Francisco on January 31, 2019 by Jason McDonald.